I was inspired to do this by many other teachers out there on the Internet. I spent a lot of time researching the best plastic storage available. I finally decided to splurge on these baskets. I’m so glad I did this, as they have held up really well to the wear and tear of daily use. 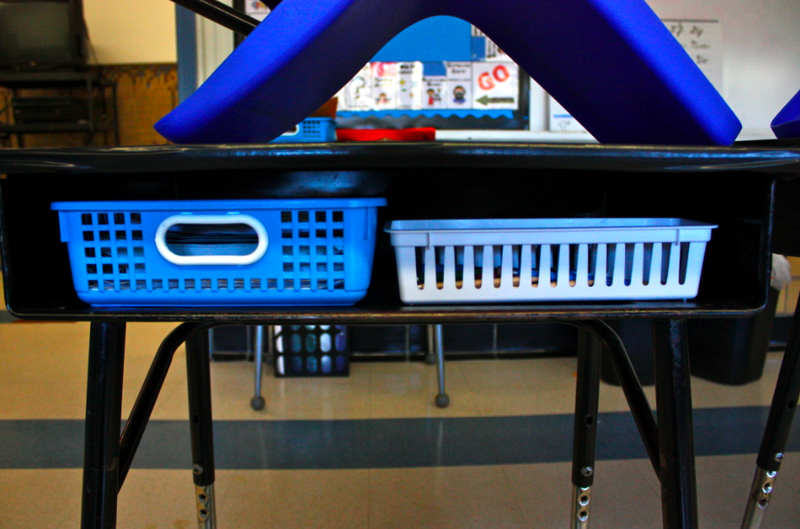 All papers, notebooks, and folders are stored in these blue baskets. The white baskets are the ones that come 3-in-a-pack at Target or Walmart. These are for pencils, erasers, and any coloring materials. It really is amazing what a difference this has made. Gone are the days of papers spilling out of the mouth of the desk. In fact, most of my students will tidy up their desks on their own when the basket gets too full! Also, I haven’t really heard this phrase at all this year: “I don’t have a pencil!” (you know, just as the lesson is in full swing!). The students are able to assess the pencil situation first thing in the morning by looking in their white baskets. I love how my students have become self-sufficient in keeping their work and desks organized! All thanks to some beautiful baskets! I use these baskets as turn in bins but I've never used them inside student desks before. I think I might give it a try. I'm wondering if my students books will cause a problem. Maybe I could have them keep test books on a shelf until needed. hmmmmm….